A full-colour MindMap of the entire book - containing a vivid summary of all the strategies and concepts I can use to instantly recall everything inside. Ten (10) Chapter Summary MindMaps for each chapter of the book - one each week for the next ten weeks! Premium study tips and strategies via email - these tips are to ensure I apply all the secrets I learn and use them to get better grades in less time! You can order with confidence because you are protected by our 60-day Money Back Guarantee. If you are not completely satisfied with your purchase, you can simply let us know for a prompt and courteous refund. You can't lose! 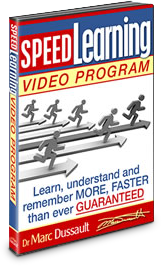 The Speed Learning Video Seminar is a companion product to Get The Best Grades With The Least Amount Of Effort. The Speed Learning Video Seminar is available via streaming video so you can absorb all my most advanced Speed Learning strategies, quickly and easily. In this Video Seminar I reveal dozens of successful techniques you can apply straight away. Just ONE of these stragies, properly applied, could save you countless hours of laborious study or bump you up a letter grade! 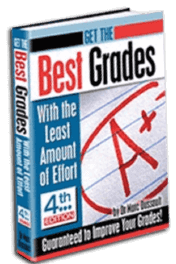 The Speed Learning Video Seminar is normally sold on it's own website for $47, but because you're purchasing today, you can get it along with Get The Best Grades With The Least Amount Of Effort for just $29 extra. That's just $49.95 for both products, a big savings off the normal price of $86.95. (Plus, you also get all the bonuses for BOTH products).